For a limited time, get $10 free to start playing your favorite casino games including slots, blackjack, roulette and more! 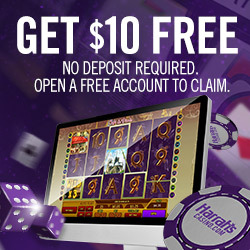 No deposit is necessary to start playing, just log in to HarrahsCasino.com and let the party begin! When you make your first deposit on HarrahsCasino.com we’ll match it 100% up to $300. 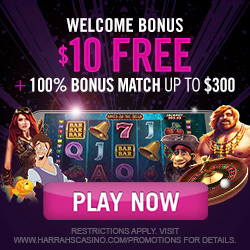 All you have to do is log-on to your HarrahsCasino.com account or sign up and make a deposit.